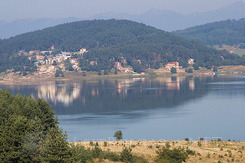 Tsigov Chark is located in the Western part of the Rhodopi mountainis, some 8 km from the town of Batak and 24 km east from Velingrad. The resort is situated nearby the artificial lake of Batak. The average altitude is 900-1100 meters above sea level. 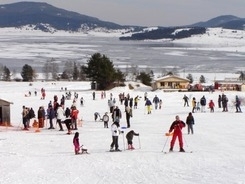 The resort is both suitable for snowsports in the winter and summer holidays (near the lake can be put a caravan or a tent). The new piste Tsigov Chark offers good conditions for skiing and snowboarding. The average drop is around 100 meters, which make is suitable for both beginners and intermediate skiers. The total length of the piste is 1500 meters. It has 2 parts: In the bottom area it is easier, suitable for beginners, there iare 2 drag lifts there. In its upper it is steeper and is served by a tow-bar drag lift. There is a project to make this piste longer in the next years. The price of 1-day lift pass is 6 ? EURO per day. A well equipped ski rental and ski instruction are available too. To rent ski equipment one have to pay is 6 ? EURO per day.